When looking for toys for the kids I almost always look for educational toys. I like when the kids sit down to play but are also building needed skills. Angel is a hard one to get to sit down but when she finds something she likes she will. We have several Learning Resources toys in our home and they all get used quite often. They are also some of my favorites. Angel is getting the "Ocean Wonders Build & Spin " gear set this year for Christmas. Angel loves her brothers gear set that I am sure she is going to love this. Plus Peanut will be able to use it when he gets bigger. I personally love the cute sea animals in the gears. 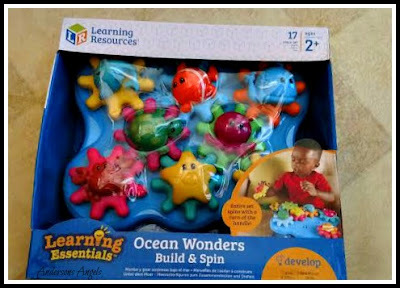 This is a hands on construction toy with colorful underwater animals that provide a fun way to build little ones fine motor skills. 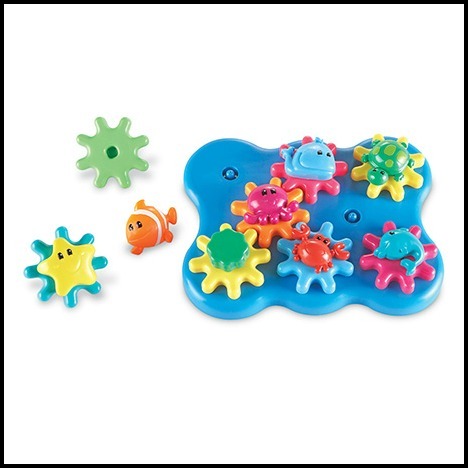 The big chunky pieces fit easily onto large gears, providing children endless mix and match play. This set also encourages children to explore cause and effect when playing. The set includes the board, 8 large gears, 7 sea creatures and 1 chunky handle. All pieces are made big and chunky because they are easier for little hands to hold then. Plus you don't have to worry about little ones choking on pieces when they are big and chunky. They also offer a flower version of this set as well which is super cute! Since this set does not take batteries you can easily wash the gears in warm soapy water to keep the toy clean and working properly. These gear sets make great gifts for the toddler in the family. I like that they build skills and it is a toy that kids will and can enjoy for a long time.